The Houston Texans are the sixth team since 1980 and the first in 20 years to make the postseason after a 0-3 start. The Texans (10-5) opened with losses to New England, Tennessee and the New York Giants that left them 0-3 and were all close games decided by a total of 15 points. Houston&apos;s rebound began with consecutive three-point wins in overtime against Indianapolis and Dallas before seven-point victories over Buffalo and Jacksonville. Washington quarterback Alex Smith broke the fibula and tibia in his right leg in a 23-21 defeat to the visiting Houston Texans on Sunday. The Texans’ J.J. Watt and Kareem Jackson sacked Smith in the third quarter, causing both bones in his lower leg to “snap like a dry tree branch” as he went down with his leg bent and “ankle flopping limply,” The Washington Post’s Thomas Boswell wrote. Smith, 34, underwent surgery at a nearby hospital, ESPN reported. &apos;&apos;Started from the bottom now we&apos;re here,&apos;&apos; he bellows. While the 2013 Drake tune is a little old to be the team&apos;s anthem, the sentiment of the song couldn&apos;t be more fitting for these Texans. After falling into such a big hole early, the Texans were written off by many as headed to a lost season. The Houston Texans have been red hot since losing their first three games and improved their winning streak to six matches on Sunday. Quarterback Deshaun Watson went 17-for-24 passing for 213 yards and two touchdowns in a 19-17 victory over the Denver Broncos. Watson connected with his favourite receiver DeAndre Hopkins 10 times for 105 yards and a touchdown, but it wasn&apos;t all Texans. The Houston Texans waited 10 months to celebrate a victory. Players mobbed kicker Ka&apos;imi Fairbairn after he made a 37-yard field goal in overtime, jumping up and down before leaving Indianapolis with a wild 37-34 victory to end the league&apos;s longest losing streak at nine. Houston (1-3) hadn&apos;t won since Nov. 19, hadn&apos;t won on the road since Sept. 14, 2017, and couldn&apos;t even beat the Colts last season without Andrew Luck. 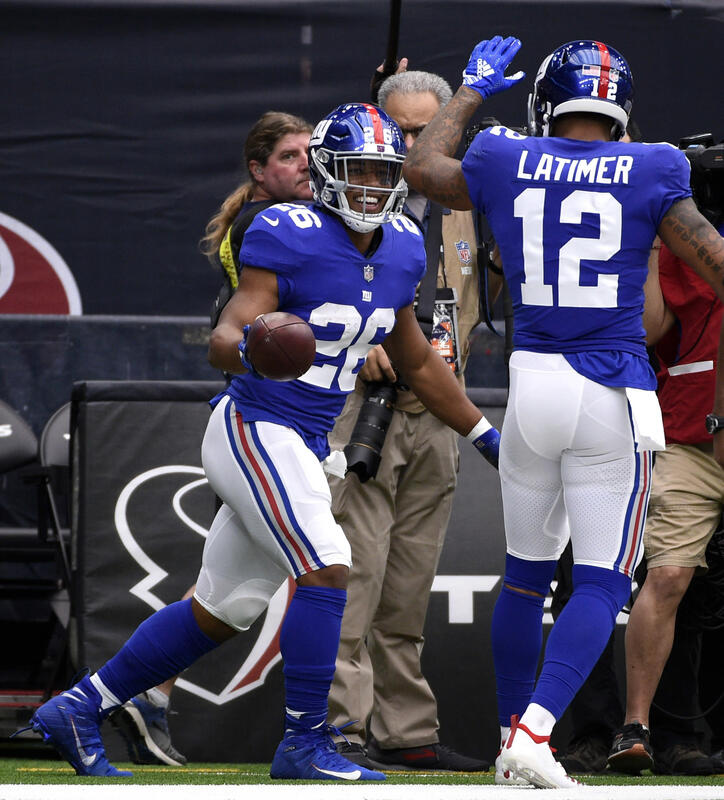 After coming up just short in their first two games, the New York Giants figured out a way to finish a game on Sunday against the Houston Texans and get their first win. &apos;&apos;We&apos;ve become an almost team,&apos;&apos; quarterback Eli Manning said. Manning threw for 297 yards and two touchdowns and rookie Saquon Barkley added a score as the Giants (1-2) got a 27-22 victory over the struggling Houston Texans. With J.J. Watt and Deshaun Watson healthy and back on the field for the Houston Texans, expectations were high they&apos;d turn things around after last year&apos;s dreadful season. Instead, Sunday&apos;s 27-22 loss to the New York Giants put them into an 0-3 hole and had coaches and players searching for answers. "We&apos;ve got to figure something out," Watt said. After two difficult losses, Odell Beckham Jr. saw a different energy in the New York Giants on Sunday. Eli Manning threw for 297 yards and two touchdowns and rookie Saquon Barkley added a score as the Giants got a 27-22 victory over the struggling Houston Texans. The Giants (1-2) were up by 14 at halftime but had trouble moving the ball in the second half. The return from injury of star wide receiver Odell Beckham Jr. and addition of prize rookie running back Saquon Barkley provided plenty of optimism for the New York Giants entering the season. A similar mindset was held by the Houston Texans, who had lofty expectations of their own with second-year quarterback Deshaun Watson and standout defensive end J.J. Watt back to full health. With the memory of last season&apos;s 3-13 debacle fresh in their collective minds, New York players are trying not to overreact to the team&apos;s fifth 0-2 start in the past six years.